Wanna buy an 80-foot igloo? The embodiment of an Alaska cliche is for sale. 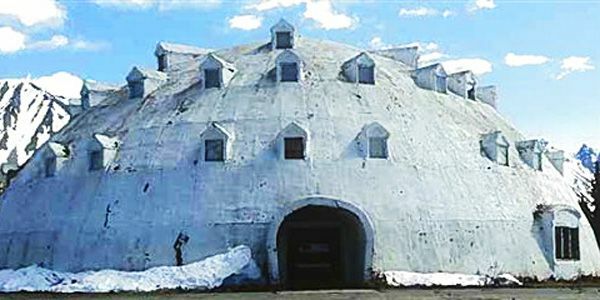 The massive urethane igloo that's a must-stop for summer tourists heading up the Parks Highway en route to Denali National Park and Preserve can be had for $300,000. The 80-foot high structure was erected more than four decades ago over a shell of plywood and two-by-sixes, and was never completed on a 38-acre site, which is part of the sales package. The igloo, which shows its age, has never been anything more than a magnet for cameras and vandals, who set off firecrackers in its cavernous interior before it was boarded up. But for someone with lots of money to spare, property owner Brad Fisher sees great possibilities for the picturesque location in Alaska's interior. The site, 20 miles from the nearest community at Cantwell, is prime snowmobiling country in winter and hiking in summer, a land of rolling hills and willows surrounded by mountains and splendid views. Fisher, 55, envisions the igloo as an eye-catching seasonal restaurant and hotel run on green power. Here's the catch: Creating a viable business could run a new owner at least a couple million bucks to get it ready and up to code. For one thing, there is no available electricity around, which demands additional costs. According to an estimate 15 years ago, putting in a utility substation would cost $1.3 million. Fisher thinks powering it with such innovations as solar panels and windmills is the more affordable way to go. It sure would be a shame to see the igloo go to waste, he said. "If you had the money to get it going, I have no doubt that you could make money there just because of where it is," he said. "I mean, everybody stops and looks at it." Critical thinking challenge: Why might the igloo be difficult to sell? I do not think I could ever buy an igloo as a house for $300,000. I would love to stay in the igloo for a night or two though because I think it would be a once in a lifetime opportunity. However I do not think I would ever buy it as my home. I would love to visit an igloo! It would be such a cool experience to look inside one, and see how people live in that type of environment. I think that this sculpture thing is so cool! Its like a humongous igloo that you can stay in! I wouldn't spend that much money on everything though. There are kids in Africa starving and then we are wasting money on things like this. Several things would make the igloo hard to sell. First, it has no available electricity around, which demands additional costs. Second, it isn't the sturdiest house, yes it is supported by plywood and two-by-sixes, but its not as sturdy as a normal house. Lastly, if it gets real hot for some reason in Alaska and it could melt the igloo. I personally would not buy that igloo because I for one don't like the cold, and I mean it would be hard to sell because not many people live in igloos. It is a shame that the igloo has to go to waste. I would not want to sell or buy an igloo. I would have no use for it and I do not know why anybody would want to buy an igloo. I really don't think that buying a igloo would be worth it because it would end up melting, and this would be a major waste of money. I think it is awesome that people made a 80 foot igloo during the winter but the problem is what if it gets too hot and the igloo starts to melt. Also that the igloo is going to cost alot of money to make it into a business like a restaurant or a little hotel. this article is about the igloo. the reason the igloo is difficult to sell is because the igloo is expensive and it cost $300,000 that's a lot of money. 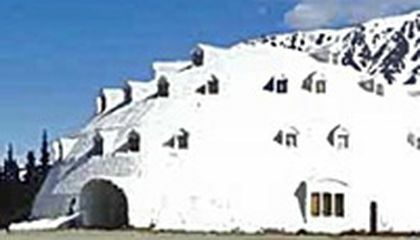 the igloo is so big that it can be a restaurant and a hotel but the problem is it doesn't have electricity it cost $1.3 million. This igloo has not power so they are trying to put power in the. Igloo. They want to put a hotel in the igloo. The igloo will be difficult to sell be they can have someone can go in so they can have people in the igloo is people can go in it and people take picture if the igloo.